Christopher Nolan is not concerned with putting too fine a point on anything. In "The Dark Knight," he offered an extremely thinly-veiled critique of the war on terror (remember Batman's illegal phone tapping? 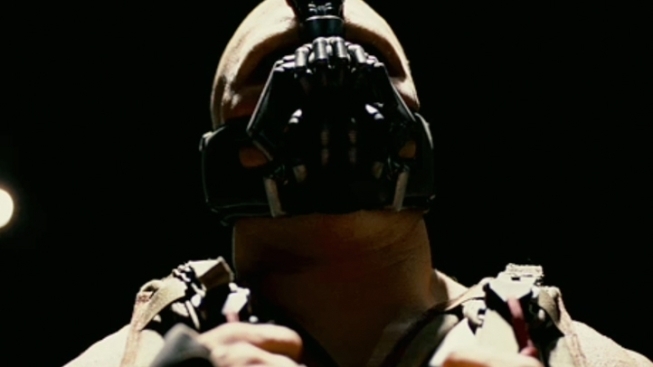 ), and for his grand finale – next summer's "The Dark Knight Rises" – he is clearly all about Occupy Gotham. Selena Kyle (aka Catwoman, aka Anne Hathaway) delivers the point home, telling Bruce Wayne that he and the rest of Gotham's wealthy are about to face a "storm," led by a hulking man in a mask named Bane (Tom Hardy), as images of mansions being ransacked plays over the scene. It ain't subtle, but since when are comic books subtle? The trailer also gives us a look at Gotham's professional football team (played by members of the real-life Pittsburgh Steelers, including an earthquake-outrunning Hines Ward), an amazing flying Batmobile and mysterious glimpses of Joseph Gordon-Levitt and Marion Cotillard. "The Dark Knight Rises" opens everywhere July 20, 2012.